Another allusive, entertaining inquiry by veteran musicologist Marcus (The Doors: A Lifetime of Listening to Five Mean Years, 2011, etc.). The opening is an accidental tour de force: a list that runs on for a full six pages of the inductees to date into the Rock and Roll Hall of Fame, one that, though full of lacunae, is still wildly suggestive of just how influential and deep-rooted the sound is in our culture. He takes Neil Young’s observation that “rock & roll is reckless abandon” and runs with it, looking into 10 songs that are particularly emblematic. 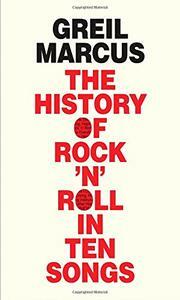 Even though any other 10, 100 or 1,000 songs might have done just as well, one cannot fault Marcus’ taste. It is just right, on the reckless abandon front, that his survey should begin with the Flamin’ Groovies jittery, diamondlike anthem “Shake Some Action,” released to the world in 1976 and heard, if not widely, by at least the right people. “I never heard Young’s words translated with more urgency, with more joy,” Marcus avers, than in the goofily named Groovies’ (“a name so stupid it can’t transcend its own irony”) song. Yet there are other candidates for best paean to reckless abandon, or perhaps best inspirer thereof, including the prolegomenon to all other songs about filthy lucre and lolly, Barrett Strong’s “Money”; the lovely but portentous Buddy Holly ballad “Crying, Waiting, Hoping”; and the Teddy Bears’ 1958 hit “To Know Him Is to Love Him,” which, though tender, became something hauntingly lost in the hands of Amy Winehouse. It’s no accident that the originals of many of these tunes lay at the heart of the early Beatles’ repertoire, nor that Phil Spector played his part in the uproarious proceedings, nor that from every measure of music, thousands of tangled storylines flow—many of which Marcus follows wherever they will lead, to our edification. Essayistic, occasionally disconnected, but Marcus does what he does best: makes us feel smarter about what we’re putting into our ears.